A Tiger was observed about 3,000 yards away, engaging three Shermans. When it set one of the Shermans afire, the other two withdrew over a crest. A 17-pounder was brought up to within 2,400 yards of the Tiger, and engaged it from a flank. 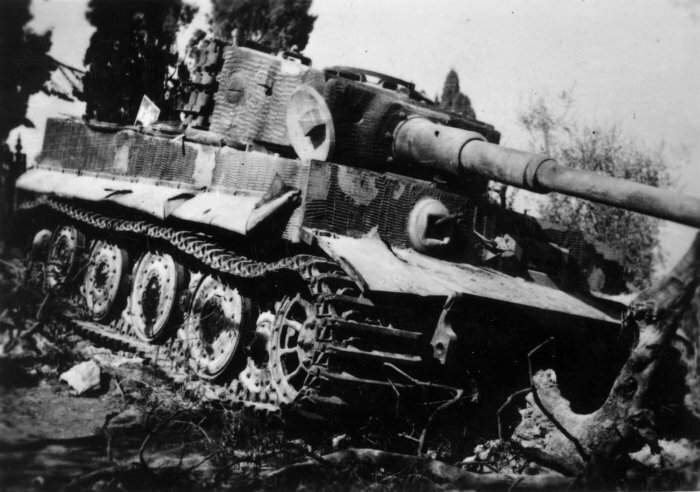 When the Tiger realized that it was being engaged by a high-velocity gun, it swung around 90 degrees so that its heavy frontal armor was toward the gun. In the ensuing duel, one round hit the turret, another round hit the suspension, and two near-short rounds probably ricocheted into the tank. The tank was not put out of action. The range was too great to expect a kill; hence the New Zealanders' tactics were to make the Tiger expose its flank to the Shermans at a range of almost 500 yards, by swinging around onto the antitank gun. The Tiger did just this, and, when it was engaged by the Shermans, it withdrew. The enemy infantry protection of half a dozen to a dozen men was engaged by machine guns. At the junction of a main road and a side road, a Tiger was just off the road, engaging forward troops in buildings. Another Tiger, about 50 yards up the side road, was supporting the first. A field-artillery concentration was called for. It appeared to come from one battery only. Although no hits were observed, both Tigers withdrew. A Tiger on a ridge was engaged by what appeared to be a battery of mediums. After the first few rounds had fallen, the crew bailed out. (It is not known why.) Shortly afterward, while the tank still was being shelled, a German soldier returned to the tank and drove it off. About 10 minutes later, the remainder of the crew made a dash along the same route their tank had taken. A tank hidden in the garage of a two-story house ventured out for about 20 yards, fired a few harassing rounds, and returned to its shelter. Many hits on the building were scored by 4.2-inch mortars firing cap-on, but little damage was visible. Each night the tank was withdrawn from the area, even though it was in an excellent concealed position and was protected by infantry. Later the house was examined. Although it had suffered appreciable damage — and there were several dead Germans about there was no evidence that damage had been done to the tank itself.